The following are just a sampling of the many beautiful bike trails on Cape Cod. You may also want to check out Bike Maps of Cape Cod & The Islands at www.lacamco.com. This pair of bikepaths runs on both sides of the Cape Cod Canal which separates Cape Cod from the rest of Massachusetts. They are maintained by the Army Corps of Engineers and provide a great place from which to watch ships going through the canal and cars stuck in traffic on the bridges. The Cape Cod Rail Trail follows a former railroad right-of-way for 25 miles through the towns of Dennis, Harwich, Brewster, Orleans, Eastham and Wellfleet. Its paved surface, few hills, and well-marked automobile crossings make it ideal for cyclists. The trail has a wide unpaved shoulder on one side to accommodate horseback riding, walkers, and runners. More information on the Cape Cod Rail Trail, visit http://www.mass.gov/dcr/parks/southeast/ccrt.htm. Branching off from the Cape Cod Rail Trail in a spectacular bicycle rotary (traffic circle to non-New Englanders), this path is finally paved all the way to the center of Chatham. It is fairly well signed, with interesting treatments of major road intersections and includes direct connections to parks and the Harwich Town Hall, and thus picturesque Harwich Center. This 1900-acre state park in Brewster has 420 campsites spread out in 7 areas throughout the park, all connected by a system of paved bikepaths as well as the main park road. The park bikepaths include several loops off into the woods which are great for animal watching and studying the landforms and vegetation of Cape Cod. The park paths do not connect directly to the Cape Cod Rail Trail; there is a rather awkward crossing of the main park entrance and a highly trafficked parking lot, though the distance is only 100 yards or so. Three paved trails expose bicyclists to a variety of Cape Cod experiences. The Nauset Trail in Eastham, from the Salt Pond Visitor Center, runs from Route 6 to Coast Guard Beach. The Head of the Meadow Trail in Truro travels through an interesting inter-dune area. Watch for the well from which the Pilgrims got their first fresh water after crossing the Atlantic Ocean. The Province Lands Trails, wind through the dunes from Provincetown to Race Point and Herring Cove Beaches. A map is available from the Visitor Centers at Salt Pond in Eastham and in the Province Lands in Provincetown. 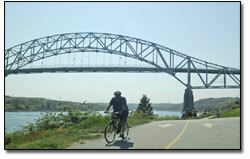 For comprehensive information on Cape Cod Bikeways and Trails visit MassBike.